World Class Outdoor Lighting was featured in an article, Shine On-Outdoor Lights Enhance a Home in Biz Times on July 21, 2006, written by Elizabeth Geldermann. Here are a few exerpts from that article and a link to the entire article on www.biztimes.com. Effective outdoor lighting can increase the quality and curb appeal of a home, while also increasing the quality of life for those who live there. In the typical front yard, a house may have four or five lights along a front walkway, a lantern light in a bush near the front property line and lights above the garage door and front door. While this typical lighting set-up is unobtrusive and utilitarian, much more can be done to use less energy and to accent the architectural beauty of a home, lighting professionals say. Waukesha-based World Class Outdoor Lighting LLC mainly works with residential properties in southeastern Wisconsin and has designed lighting systems for all types and sizes of homes, said co-owner Kevin Hunt. Many homeowners looking for outdoor lighting are interested in entertainment lighting for the patio, pool and deck areas of the backyard, said World Class Outdoor Lighting co-owner Brian Webb. "Lights make a house look like a home instead of another piece of property," Webb said. "Using fixtures small in number and size make the property better looking during the day and cause less light to cast everywhere at night." In the backyard, lighting can accent sculptures, birdbaths and trees or light a patio and hot tub area for safety and ambiance. 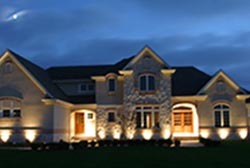 World Class Outdoor Lighting uses low-voltage lighting for its crisp white color and energy conservation. With low-voltage lighting, a homeowner can accent the texture of brick or a domed window. Low-voltage bulbs also last longer than high-voltage bulbs and gives off a softer, more dispersed light, instead of a harsh spotlight effect, Webb said. World Class Outdoor Lighting prefers to light a home or landscape without interrupting the inside of a home. "From the inside, the light is uniform so that all of the windows are dark," Webb said. "And from the outside, no light is blasting on the reflective spots of the house. Hunt and Webb consult with customers to determine what the customer is looking for and what fits in the budget. Outdoor lighting can be a costly investment. A 2,500 square-foot home with a budget of $1,500 would only have the ability to concentrate on one side of the house for lighting, Webb said. Instead of doing a mediocre job placing lights on both the front and back yards, World Class Outdoor Lighting suggests homeowners concentrate on one part of their home first. "It is important to get a budget together to light the front yard to make it bright and tasteful, Webb said. "Leave the backyard dark until you can budget for it. Once customers see what we have done, 85 percent add lights in the backyard."